The Chamber Singers joined Groban in Kansas City for "an emotional reading of “Dust and Ashes," which he will perform as part of his Broadway show this fall. 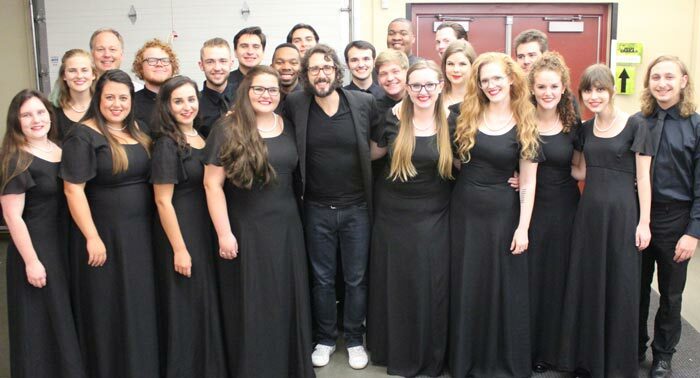 Webster University Chamber Singers performed yet again with Josh Groban, pop superstar, on Tuesday, Aug. 16, this time at Starlight Theatre in Kansas City. Groban, who will headline a new Broadway show this autumn, is wrapping up a USA tour to promote his latest album, Stages, featuring songs from the Broadway stage. The Kansas City Star's concert review noted the significance of the appearance, as the Chamber Singers joined Groban for "an emotional reading of 'Dust & Ashes,' a consequential new song he will perform in two months when he makes his Broadway debut in 'Natasha, Pierre and the Great Comet of 1812.'" Those previous appearances include Groban's sold-out performance at the Peabody Opera House in St. Louis last fall.